Ever wonder how those bugs get inside your home? Well, one possible way is your HVAC (Heating, Ventilation, and Air Conditioning) system. In an extreme environment where it gets above 100 degrees Fahrenheit in the Summer and below 30 in the winter, like Las Vegas, NV, a fully functional air conditioning and heating system is imperative. However, because of the extreme shift in temperatures, there tends to be yearly cracks and gaps created from the expansion and contraction. 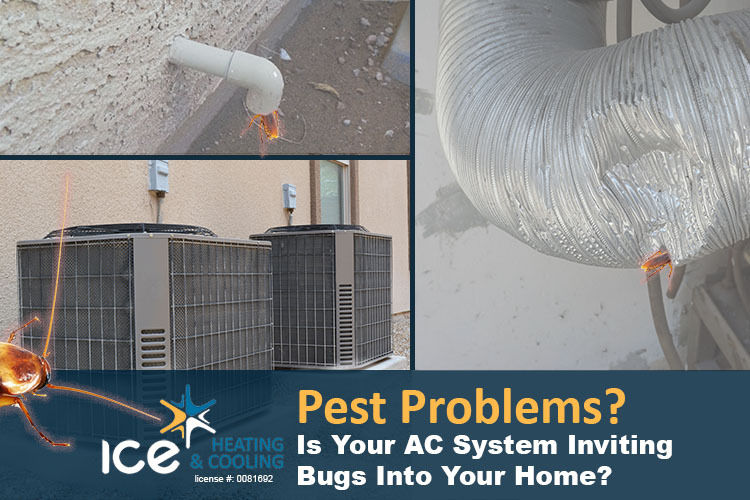 Leaving an open invitation for Pests (bugs) to invade your home and AC system. Pests like cockroaches, silverfish, and spiders can cause your HVAC equipment to malfunction and expose your family to poor indoor air quality and other health risks. Rodents, insects and other pests can destroy the ductwork of your HVAC system while decomposing bugs can contaminate the airflow with foul odors and allergens. 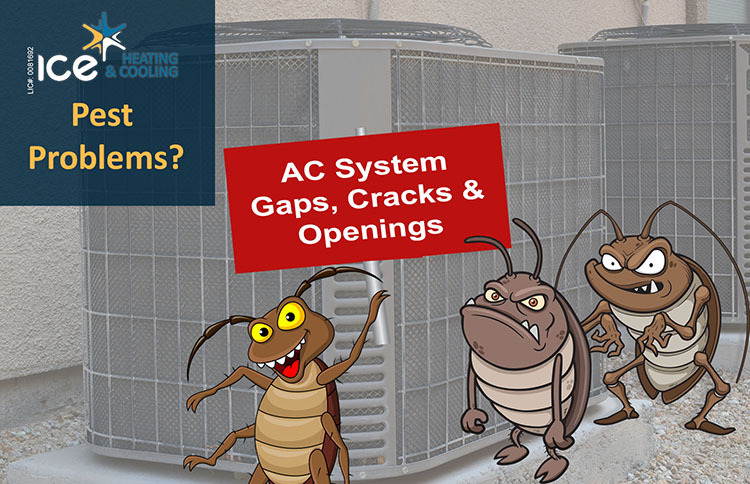 To prevent these pests’ issues maintenance should be performed twice a year on your AC system. During the maintenance process, an ICE AC repair tech will ensure your AC system is properly sealed and repair any cracks and gaps thereby safeguarding against any pests. Plus, the system will be cleaned and restored to proper manufacture recommended working specs. Pest proofing your HVAC system is the way to go. Ice Heating & Cooling makes it affordable to pest proof your HVAC system, and for those with allergy issues this might be one of the best heating & cooling investments you can make. Ducts and vents inside an HVAC system are perfect passageways for pests to get into your home. Make sure that the ducts and vents in your system are closed off properly. When your HVAC system is first installed, the ducts and piping are sealed to prevent condensed water and air from leaking. Over time, the Summer and Winter extreme temperatures causes the sealant to crack and create openings. These cracks are perfect entry points for pests. Resealing these ducts with a professional grade quality sealant will prevent these pests from getting into your air conditioning unit. Split air conditioning systems consists of an indoor unit (heater and blower) and an outdoor unit (condenser or heat pump). The outdoor unit houses the compressor, coils and a large fan. The outdoor unit is a dust magnet, and if not cleaned regularly will attract many pests and bugs to it and could cause an electrical issue as bugs tend to get in between electrical parts. The indoor unit usually attracts rodents, cockroaches, silverfish and spiders. Scheduled routine maintenance for your HVAC system is an essential measure to take to prevent bugs and pests from getting into your air conditioning system. An ICE technician will make sure that such unwanted elements are removed from your heating and cooling system, keeping you and your family breathing cleaner air.